The Victoria and Albert Museum’s current blockbuster exhibition, Frida Kahlo: Making Herself Up, celebrates the life and career of the artist Frida Kahlo (1907-1954). The impact of Kahlo’s iconic image, which has been immortalised in her self-portraits and by countless photographers, has been assumed by feminists, artists and fashion designers who are influenced not only by her artwork, but by her amazing life and personal style. The origins of the V&A exhibition begin in Mexico with the house that Kahlo was born, lived and died in. La Casa Azul (The Blue House) in Mexico City has been a museum dedicated to Kahlo’s life and career since 1957, but in 2004 a personal archive of 6,000 photographs, 12,000 documents and 300 items, including clothing, jewellery, cosmetics and medicines were found locked away in the bathroom adjacent to Kahlo’s bedroom. These items had been stored away from view by Kahlo’s husband, Diego Rivera, following her death in 1954. The Frida Kahlo Museum undertook a four year project to research, catalogue and conserve the collection before publicly announcing their findings in 2007. 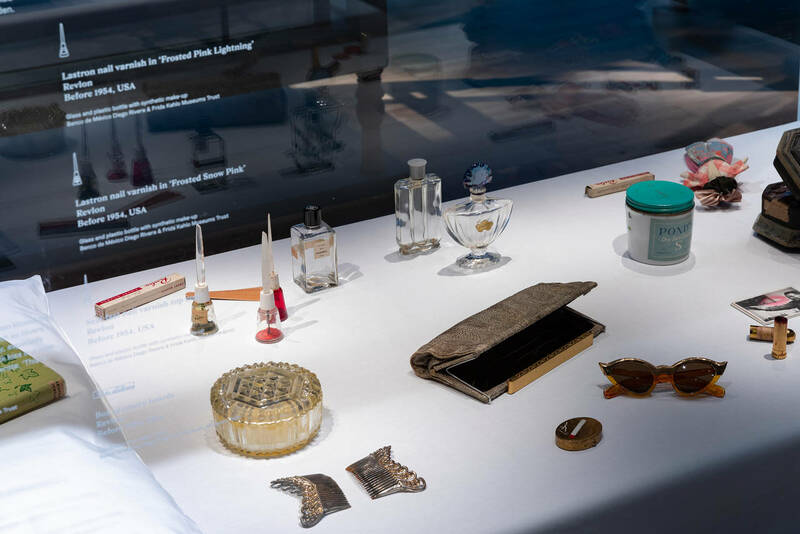 200 objects from this personal collection have been allowed to leave Mexico for the first time in order to be loaned to the V&A to make-up the exhibition that also includes Kahlo’s self-portraits, photographs and film. 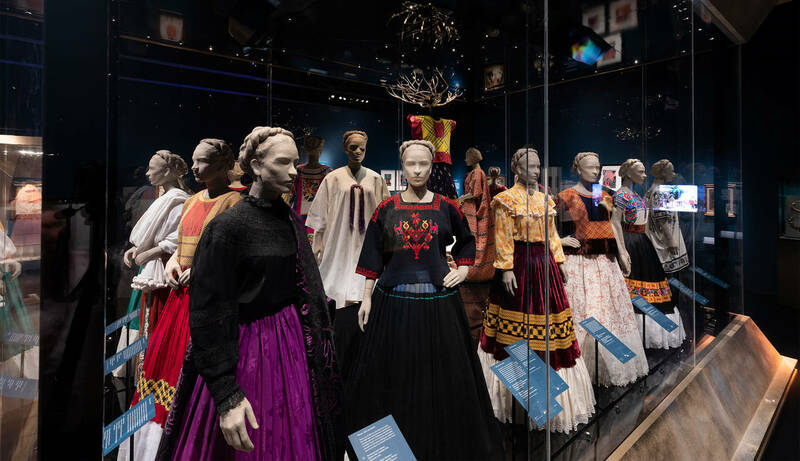 The display of Frida Kahlo’s clothing highlights how she constructed her image and identity through her Mexican heritage, her Communist political beliefs and her art. Frida lived during a period when regional diversity was celebrated in Mexico and nationalism was at its height. The collection of her clothing comprises mainly of traditional Mexican pieces from the Tehuana, a matriarchal society based in the Isthmus of Tehuantepec, Oaxaca State. The heavily adorned Tehuana clothing enabled Kahlo to manipulate her bodies’ proportions and to hide the medial corsets and orthopaedic equipment she had worn since a devastating tram crash in 1925. 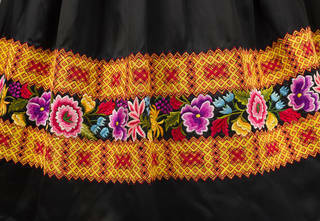 Tehuana dress contains three elements: a square-cut, sleeveless tunic made from one, two or three panels of material (the huipil), a long skirt with a gathered waistband (the enagua) and a braided hairstyle adorned with flowers. 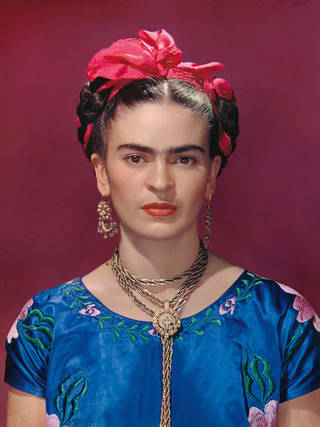 By also wearing a fringed shawl (a rebozo), Kahlo’s style of dress helped to direct the viewers gaze away from the physical impairments of her lower body. Even though her clothes were a form of self-expression for Kahlo, she chose comfortable fabrics, such as cotton and silks, which she sometimes sewed and personalised herself. 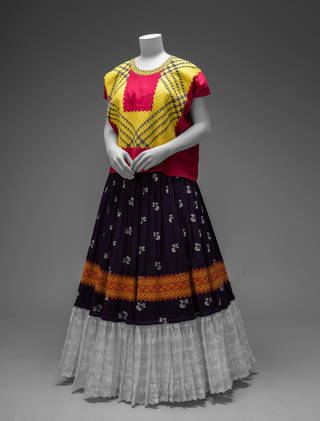 Kahlo also combined Guatemalan and Chinese items, alongside European and American blouses with indigenous garments from the different regions of Mexico. The exhibition and accompanying book reveal how Kahlo used indigenous textiles to develop and craft her own personal identity which she added to with jewellery, accessories, shoes and make-up. The V&A have used 17 bespoke mannequins from Proportion London that were hand-crafted to Frida’s petite proportions and feature hand poses from her paintings and photographs. The mannequins are unusual in that they feature heads that have been crafted using 3D printing with recognisable features, such as Frida’s braided hair and iconic eyebrows (see V&A video https://www.vam.ac.uk/articles/making-the-frida-kahlo-mannequins). The figures were finished in papier-mâché to allow the clothing to take centre-stage, which has the effect of making the Frida mannequins resemble Mexican deities. Frida Kahlo: Making Herself Up has already been viewed by over 200,000 people and has recently been extended for another two weeks until Sunday 18th November. There will also be a 48-hour opening period over the 2nd-4th November to coincide with the Mexican Day of the Dead holiday. 1. Wilcox, Claire, and Henestrosa, Circe (ed.) (2018). Frida Kahlo: Making Herself Up. London: V&A Publishing. 2. Herrera, Hayden (2002). Frida: A Biography of Frida Kahlo. New York, NY: Harper Perennial.